In unstable groups, where membership changes frequently, it is less clear if specific leaders exist. In fission-fusion groups the main “parent” group can split (fission) into smaller subgroups to forage or travel, but subgroups may rejoin (fusion) the primary group at other times. Indeed, the composition of the subgroups may also change during the course of a day. In such dynamic and fluid social groups consistent leadership is less likely because interactions among the same individuals are less frequent. There are two conditions where leadership might develop in fission-fusion species. First, in complex habitats where resources are patchy and difficult to locate or where travel between resource rich patches is dangerous, experienced individuals may become leaders even if group membership changes regularly. Alternatively, leadership may develop in fission–fusion populations if the “parent” population is small, the subgroups are small, and they have restricted ranges. Under these conditions, individuals interact regularly despite changes in group membership, and these interactions allow individuals to identify effective leaders. In the Florida Keys, bottlenose dolphins (Tursiops sp.) live in dynamic fission–fusion groups, are capable of individual recognition, and have restricted ranges and patchy food resources. Lewis and her colleagues (2011) tracked individual dolphin groups over several years. They used a video camera attached to the underside of an airship (Figure 1) to record individuals in a group and direction changes initiated by group members. 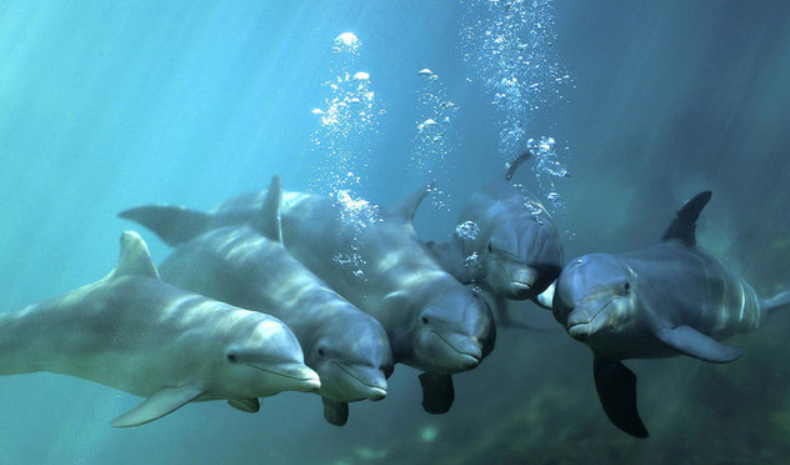 The researchers wanted to know, 1) if specific dolphins led the group more often than expected by chance; 2) if “leaders” (those in front) controlled direction changes (compared to followers); and 3) if there was any relationship between group size and number of potential leaders. Lewis and colleagues found that a small number of individuals were consistently in the front of small groups (lead position). Furthermore, these leading individuals were more likely to initiate direction changes during group travel (Figure 2). Interestingly, usually only one or two dolphins led a group regardless of group size or the length of time the group remained together. Figure 2. The number of successful direction changes attempted by “leaders” and “followers” among bottlenose dolphins in the Florida Keys. (Lewis et al. 2011). These results indicate that consistent leaders can form in highly dynamic fission-fusion species when the population size is small and individuals can recognize effective leaders within the group. Finally, the authors warn that removing “leaders” can profoundly impact the population as a whole and urge that conservation and management decisions recognize the importance of “leaders” in dolphin populations.